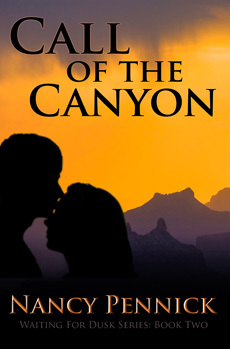 Call of the Canyon, second of the Waiting for Dusk series, continues the dramatic story of Kate Roberts and Drew Kelly. New challenges face the couple when Drew joins Kate in the present. Nothing is easy. Tyson’s still their nemesis, causing trouble whenever he can. Carl, Kate’s friend and neighbor, moves back home to Ohio and creates unexpected problems at the canyon. A wedding, a tragic accident, and a family broken by scandal affect both the past and present. And in the end, Kate may pay the ultimate price. FREE! 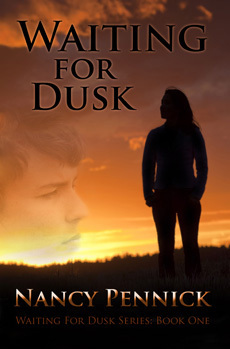 Taking Chances (Short Story #1.5 Waiting for Dusk Series) from Fire & Ice Young Adult Books, an imprint of Melange Books. Hanging from the edge of a cliff wasn’t the way Andrew Martin planned to start his day. He took a chance setting up his tripod too close to the canyon’s edge and now there he was, praying someone would come to the rescue. Luckily his good friend finds him and they head off to El Tovar for lunch. Andrew isn’t done taking chances for the day. He hears about a new girl working at the restaurant. When he meets her, she’s all he can think about. It’s 1927 and the world has certain rules to follow. Does he dare break them to be with the girl of his dreams? Broken Dreams (Prequel to the Waiting for Dusk Series – Stand alone novel) from Fire & Ice, a young adult imprint of Melange Books. “They’re Roman numerals. I think you learn about them in fourth grade. You want me to tell you what they stand for? I think a big, smart, Army guy like you should know.” I gave him a quick smile, trying to give the impression of a bratty teenager. If he knew the reason I stalled, I’d be given a truth serum and tied to a chair. 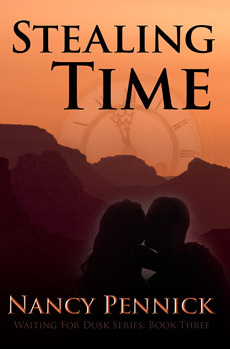 Allie Sanders thinks life in a small town can’t get any more dull and boring. She plans to escape after graduation. After a bad break-up, she wants to sail through junior year without distraction. Then the mysterious loner sits down in front of her in AP English. He’s the guy she noticed last year desperately trying to stay invisible. She wants to know his secrets. He seems different, but not in a vampire sort of way. Suddenly her much older military brother, Doug, makes a rare appearance. He takes a special interest in her life. Suspicious of his motives Allie holds back, never really trusting him. Doug wants what she wants—the boy she has come to love. No way would she let that happen. She’d go against family and friends to protect him—and his secrets—even if it ends up breaking her heart.